Vaporetto Day Trips to the lagoon Islands of Venice. Take the vaporetto to Murano, Burano, Torcello, San Lazzaro and Lido and discover sights and scenes that compliment a holiday to Venice’s main islands. The islands of the Venetian lagoon offer a different dimension to a holiday to Venice. Many are private and remote but there are plenty of others that make perfect daytrips from Venice. Murano, Burano and Torcello, are home to some of Venice’s famous industries and are amongst the earliest settlements in the northern lagoon. In contrast, San Lazzaro offers an unusual and tranquil alternative to sightseeing in the city while Lido, with its beaches and shady canals is the perfect place to relax. All can be reached easily by the Venetian vaporetto network. The vaporetto network is a perfect way to see the sights of Venice. The smallest, unoccupied or most private islands are not covered by the network. But there are plenty of others, both popular and unusual that can be reached by water bus. An economical tourist pass allows visitors unlimited travel for a weekend or a week (seewww.hellovenezia.it for latest prices and timetables). One of the closest of the islands to Venice, Murano has been famous for its glassmaking since the 13th century. 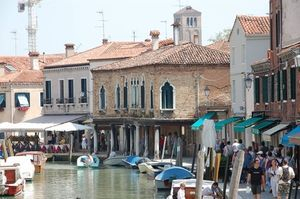 The island is still the centre of production for the famous Murano glass whilst retaining elements of its medieval past. Murano also retains many of its original medieval buildings whose arabesque styled architecture, painted in the traditional red and green lends charm to the island’s canal sides. Today, these buildings house glass shops. But beware because not all glass on sale is genuine -cheap foreign imitations are common. But it is possible to find genuine Venetian glass bargains if you know what to look for. Aside from glassmaking, interesting sights include the13th century Basilica dei Santi Maria e Donate with its mosaic floor made from fragments of glass from the island’s ancient foundries (Open 8-noon, 4-6pm and mornings only on Sunday. Telephone: : 041 739056). With its lively docks and vividly coloured buildings, the island of Burano has a cheerful, seaside feel. Once the centre of, Venice’s lace making, its main trades today are fishing, supplying the Rialto markets as well as its own charm. Lace is still sold although little of it is genuine Burano lace. However, the Scuola dei Merletti (tel.041 730034 Piazza Baldassare Galuppi) still teaches the art and has displays of the real thing. After a visit, try out local seafood specialties at a trattoria such as Da Romano (tel 041730030, closed mid-December and January, Sunday evenings and all day Tuesday). Torcello was one of the first inhabited islands in the lagoon, and home to over 20,000 people in its heyday. Nowadays, only a few dozen inhabitants live on the island making a living fishing and growing crops. The island is remote and can only be reached by vaporetto via the hourly service from Burano. But Torcello is certainly worth a visit. For lovers of history, there are some of the oldest buildings in the lagoon, such as the medieval cathedral of Santa Maria dell Assunta. The island is also the perfect place to retreat from the crowds for an hour or two, enjoying a view of Torcello’s peaceful canals and fields whilst enjoying a relaxing drink in the garden of one of the islands quiet restaurants. For a different kind of escape from Venice’s crowds, follow in the footsteps of Lord Byron and retreat south to the monastery island of St Lazzaro. Byron used to row to the island from his house on the Grand Canal. Today, it’s more advisable to take the number 20 vaporetto from the San Zaccharia. Originally a leper hospital, this peaceful green island became an Armenian monastery in 1717. Lord Byron used to visit to study with the monks and a room of the poet’s possessions is preserved along with a library and small museum which includes one of the world’s best preserved mummies. Access to the monastery is strictly limited between the hours of 3.25 and 5pm (tel 041 5260104). Marking the border between sea and lagoon, the lido was originally Venice’s first line of defense against maritime attack before becoming the premier beach resort in Europe in the early twentieth century. This heyday may be gone but the lido’s beaches are still popular with Venetians and day-trippers seeking a respite from the bustle of Venice. Most of the beaches on the island are controlled by the grand hotels but there are quieter public beaches at the north of the island. A pleasant way to reach them is to cycle using a hired bike from a shop near the vaporetto stop - the Island has some shady green canals to explore en route. Lido is also the only lagoon island with roads so if you yearn from a respite from boat travel, you can always avoid the water and take the bus.